Guitar amps, like other electric equipment, require regular maintenance to prolong their life. If your amp uses tubes, you must periodically check and replace the tubes, similar to replacing light bulbs in your house. If you hear a strange buzz coming from your guitar amp, it could be for a number of reasons. Turn your amp off, then check each cable connection and wall power connection. If anything is not fully plugged in, that is the likely source of the buzz. Ensure all connections are secure and tight, then power the amp back on. If the buzz is still there, exclude any floor pedals or effects from the chain and plug your guitar directly into your amp. If the buzz is gone, then you have a bad cable somewhere in your chain that needs to be replaced, or your electronics need new batteries or have another issue. Slowly add each electronic effect back into the chain, one at a time, until the buzz returns. The last effect you added before the buzz returns is the culprit; you can try different cables or remove that effect altogether until you have a chance to have it looked at. Remember: the more effects and connections you have in your guitar rig setup, the more chances you have for problems. It only takes one bad connection to make the whole rig buzz. Troubleshoot the setup to see if you can pinpoint the source of the buzz. Move your rig to a different room and turn it back on. If the buzz is gone, then the source of the buzz was likely the electrical circuit you were connected to originally. If the buzz is still there, try a different guitar if possible. If the buzz is gone, then the issue is with your guitar. If the buzz remains, try a new amp if possible to see if the issue is with your amp. If the buzz is still there with a new guitar and a new amp, try different cables. Cables deteriorate in performance over time and need to be replaced every year or so (depending on how often you use them). If your guitar amp uses tubes, replace the tubes and try again. Continue troubleshooting the issue by adding and removing different variables until you narrow down the source of the buzz. Check to see that the levels on your amp are set normally. If your gain, distortion or volume is turned up more than normal, it might be causing the buzz. Turn the levels down and see if the buzz subsides. If it does not, the the levels are not causing the issue. Also check to make sure your distortion effects are not enabled. Distortion effects have a naturally buzz that you cannot hear when you are playing, but when the guitar is quiet and the distortion is on, you will hear a buzz from your amp. A power conditioner helps regulate the electricity that your guitar rig uses. If you use a lot of electronics in your setup, a power conditioner will help you control all of the electricity and eliminate unwanted buzz that is a result of poorly distributed power. Without a power conditioner, you might be pulling too much power from the particular circuit you are plugged into, which can cause your amp to buzz or even short circuit if it is being pushed too hard without enough electricity. Check the speaker cones on your amp. If one is torn, cracked, dented or out of place, it can cause a buzz. 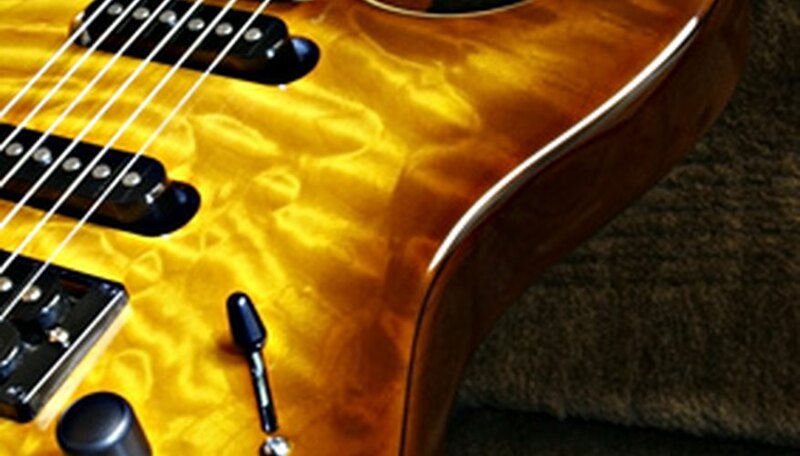 Take the amp to a musical equipment repair shop to assess the damage. If the damage is minimal, it can likely be fixed. However, if there is a large rip in the speaker, it may need to be replaced before it works properly again. To avoid ripping or damaging your speakers, purchase a hard shell amp case to keep your amp safely protected when you travel with it.